Perforated tubes are often used in automobile construction, especially in the constructon of silencers. And in the manufacture of rack systems, tubes with exact spacing between holes are absolutely necessary. In the manufacture of perforated tubes, there are of course deviations in the intervals in punched ranges. High process costs in manual fixed length re-cutting are the result. The RASACUT OC cuts perforated tubes fully automatically and ejects defective perforation intervals in the output material by itself. It reduces the high expenditures for work and material for cutting output lengths of pre-perforated tubes drastically. tubes from a bundle of tubes are automatically separated and transported to the saw with a gripper. 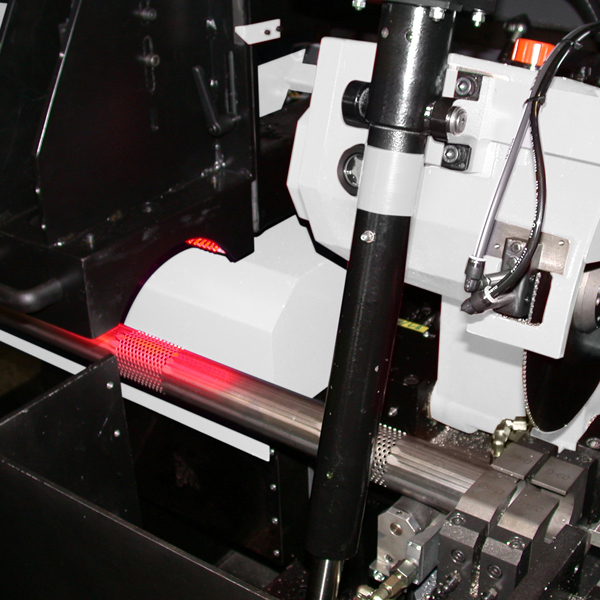 This highly precise feed is controlled by an optical systems that automatically measures the distances between punches and makes sure that the cuts between the punch point and the end of the tube are always within the prescribed tolerance. Sections in the output material in which the punching intervals are impermissibly large relative to each other are cut out and ejected. The result is drastically reduced process costs through increased output on the one hand and discontinuation of 100% controls after the fact as well as less reject material. Automatic recognition and positioning of the weld seam is possible as an option. [Cutting Speed: continuous] 30 to 250 m/min.